This is really of some help to the project I'm working on. Hope I can be of some help too in the future. And... I would really like to have my Easter holidays back there, the weather here is rainy and quite cold. The tomb of Horemheb (end 18th dynasty) includes some really interesting scenes from a military camp. Horemheb was an Army general before becoming Pharaoh, so these scenes show his life as General. One relief shows soldiers preparing a meal and filling their waterskins. The author thinks it depicts a tent. There are several small boys (with side-lock) doing chores: carrying waterskins, cleaning etc. The inside of the â€œtentâ€� shows food, amphora, and a folding chair. I think this is quite interesting, because to my knowledge (but I really don't know half as much about it as I would like to) there aren't very many military scenes left, after all - and do correct me if I'm wrong - Egyptians were not a warlike people. The territory of their kingdom has never been that vast. The egyptians seem to have regularly been at war with the Nubians. There were regular "expditions" into that area. Amenhotep III brags that his territory spans from Nubia to Naharin (which is an area in Northern Iraq). They have found the tomb of General Djehuty from the time of Thutmosis III (I think). There is a papyrus referring to the "Taking of Joppa". Thhis talks about the military exploits of that time. Thutmosis III was indeed the "Napoleon of Egypt", but I think he was the only king who was so interested in war and expansion from his territory. A big difference with Ramesses II, the "Builder King". Wasn't Thutmoses III the son of Queen Hatshepsut? Maybe this declares a lot why he could be so war-like, his mother did quite well in his place, so well she was deposed off. 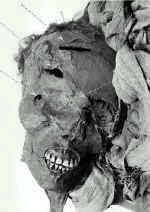 I think Thutmosis III was the nephew/step-son of Hatshepsut. I wonder if that family had more war-like tendencies, because of where they came from. Thutmosis's recent ancestors ( Seqenenre-Tao, Kamose, and Ahmose) had expelled the Hyksos. They also had to deal with an uprising in the south, so plenty of military action going on there. I must admit I never heard of Seqenenre-Tao. But the Hyksos and the "Sea People" are also very intrigueing in the Egyptian history. I know virtually nothing about the Hyksos themselves. I would like to learn more about them though. Sequnenre-Tao was a local prince in Thebes. Apohis (hope I remember the name right) sent him a message complaining that the hippopotami in the pool in Thebes were keeping him awake because of the noise they were making. Considering the distance this is clearly just a pretext to start picking on someone. At some point Sequenenre-Tao gathered enough support to start a rebellion. They have found his mummy, and it is clear that S-T fell in battle. There are axe and sword wounds evident on his head and torso. There are indeed less gruesome ways to see your life ended. Anneke, the "Apohis" guy you mentioned; can't it be "Apophis, the Patron of Evil and Darkness", the one also called "The Destroyer" and one of the most feared gods of the Egyptian pantheon? This was a hyksos King named Apophis (I did misspell it). can't it be "Apophis, the Patron of Evil and Darkness", the one also called "The Destroyer" and one of the most feared gods of the Egyptian pantheon? It must have been, naming yourself after the "devine snake"! Hey. I thought this section was about swords! From what I read in that big coffee table book about Ramesses II, the khepesh sword is useful in many ways. It is a gift given by royalty to an underling such as a soldier who has proven himself in battle, such as Ramesses has done.